I’ve been feeling a bit homesick lately. I have to say the recent -55 degree temperatures have gone a long way to making me a little less longing for home, but I still miss my home and the seasons they have. I find it very difficult to mark the passage of time when the weather and your environment looks the same every single day. While I cannot change the weather and the always green trees, I can go to the kitchen and whip up food that reminds me of family and home. Sometimes this can be a challenge as my family was not big into huge family dinners every night. My mom, her husband and my grandma all worked full time and worked different shifts so many nights, dinner was frozen food heated up by whomever was home. But some nights the stars would align and we would all be around and ready to play card and board games or watch a movie. What we lacked in dinner prep we more than made up for in snacks and appetizers. If we were going to play Monopoly or Skip-Bo, you better believe there would be crackers, cheeses, meats, dips, chips and just about any snack you can think of. 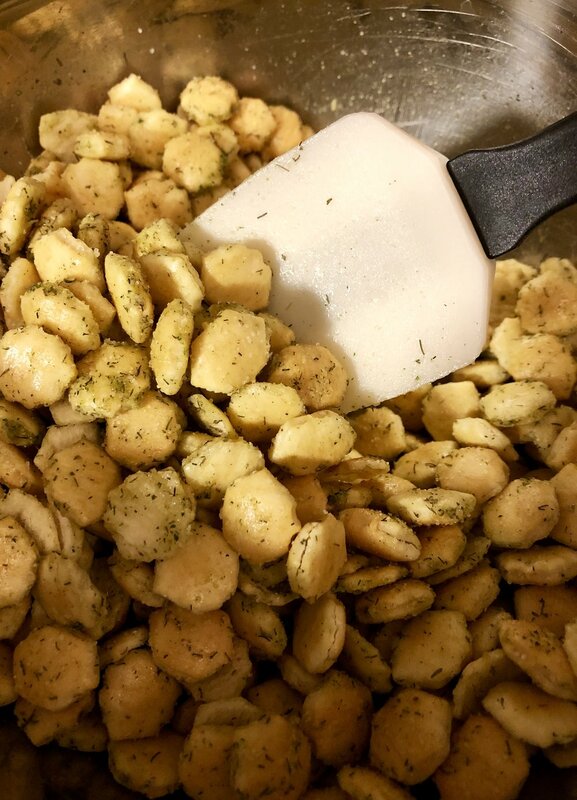 When I thought about a food I was craving that reminded me of home, oyster crackers tossed in dried ranch dressing immediately came to my mind. 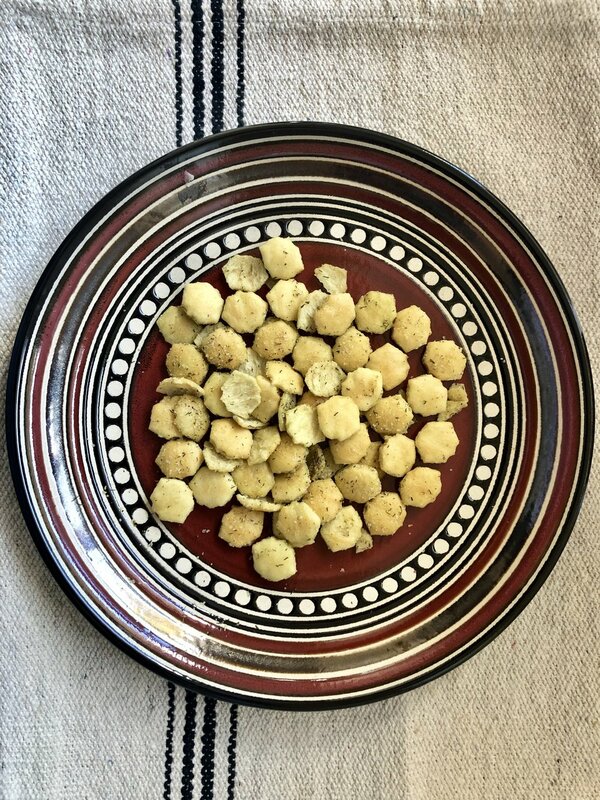 Quick and simple to make, these addictive little crackers could also be made quite inexpensively which was a win in our book as my family did not have a ton on money growing up. I’ve added some dried garlic and dill to boost the flavor, but feel free to just go with he classic dried ranch, oil and crackers. No matter how you do it, be prepared to watch these little babies disappear fast. Sweeten the pot by only making them when game night is happening, ensuring both delish eats and good company. And isn’t that the whole point of good food? The garlic powder is a yummy addition, but makes the mix a bit more salty. Feel free to omit it. I love dill but some may find it a bit much so feel free to adjust if you are not a dill fan. If you are like me and love some dill feel free to add an extra teaspoon of dill. This stores well in an airtight container for 6-7 days but if your people are like my family, it won’t last that long at all!